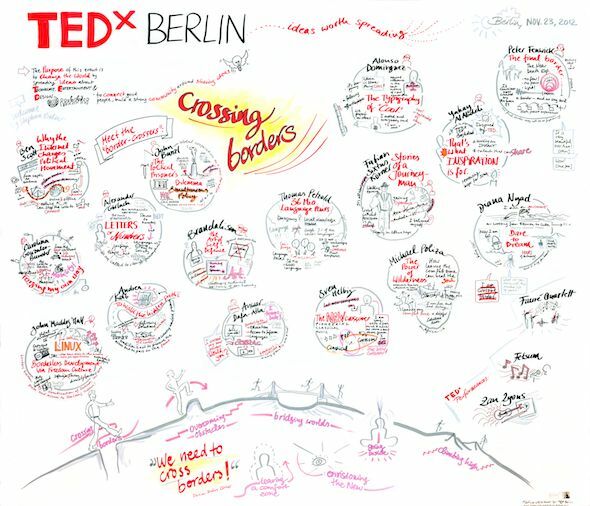 Die TEDx Berlin Konferenz 2012 wurde visuell begleitet und mittels Graphic Recording dokumentiert – ein einfaches Darstellen jedes Beitrags als auch das symbolhafte Abbilden des Konferenzthemas ‚Crossing Borders‘. Von der Konferenz-Website: What limits and borders are we faced with as individuals, as a society? Who or what defines these boundaries? What are the results of these demarcations – demarcations as barriers that may even result in scientific and artistic limitations to us as individuals and society as a whole? Are they arbitrarily defined borders or are they erected due to their necessity? Are they obstacles or are they beneficial? And what happens if we overcome these borders?